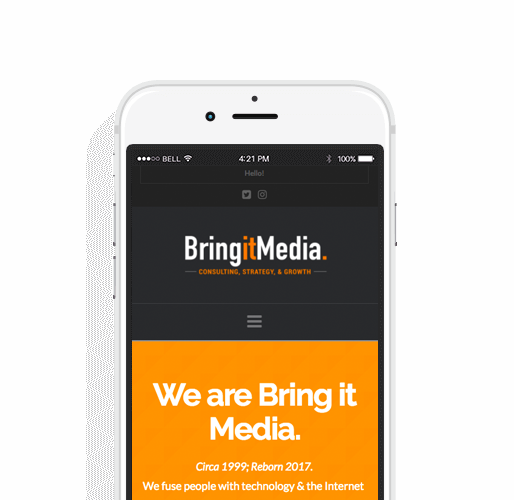 Bring it Media | Consulting. Strategy. Growth. We use technology, the internet, and our brains to help people and organizations grow and work more efficiently. We are Bring it Media. A consulting agency for smart people. You get over 20 years of experience starting, building, and selling businesses. From strategy to plan implementation, we will guide you through the smartest, most cost-efficient ways to grow your vision. Understanding you and your business allows us to advise you on the right steps to take. Creating the right business & marketing plan based on your budget, resources, and goals. Implementing and streamlining strategic plans to achieve higher sales and margins. Developing, launching, and running campaigns to attract targeted audiences. Go on, click me… BRING IT! We work with people to enhance their life and business through consulting, coaching, and challenging them to achieve a higher self. Copyright 2017, Bring it Media, Inc. All Rights Reserved.